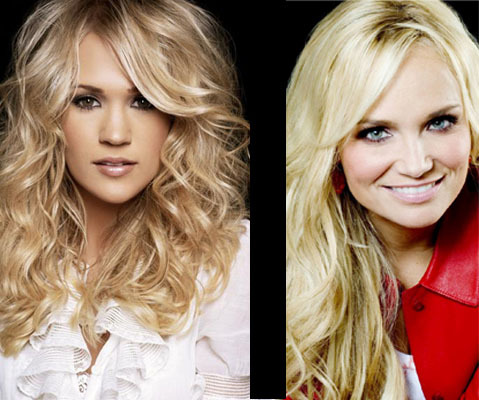 "Lessons Learned:" Who Done It Better, Carrie or Kristin? The newest Who Done It Better review will feature the Dianne Warren penned power ballad, “Lessons Learned.” As for the artists, in one corner we have the pint-sized Tony and Emmy award winning diva, Kristin Chenoweth. And in the other corner we have the American Idol winner with a voice that can knock you out, Carrie Underwood. “Lessons Learned” is a song that revolves around the simplest of themes: the lessons we learn from the experience we go through in life. With lines about “damage I cannot undo” to about how the past can’t be rewritten, this is a song full of all the cliches that come to one’s mind when thinking about the theme. I wouldn’t call this a home run from veteran songwriter Dianne Warren, but nevertheless it has been recorded twice in the country world. It first appeared on Carrie Underwood’s debut album Some Hearts and it was rerecorded by Kristin Chenoweth for her first country album, Some Lessons Learned. So, just like the previous reviews of this nature, I’ve compared the two versions side by side in the following three categories: production, vocal performance, and delivery (i.e. the emotional delivery as well as a connection to the song). This version is very heavy on the production. Nearly every instrument known to man could possibly be heard on this soaring country-pop ballad. Strings, guitars, heavy drums, keyboards, and a little steel guitar could all be heard in this over-produced version. What hurts the song is the fact that the production completely drowns out the vocals laid down by Kristin. The production here is also way too over-the-top for my ears, but it isn’t big enough to drown out Carrie’s vocal performance. The power ballad is delivered with a full string backing, heavy drumming, guitars, and plenty of keys. I prefer the production of this version simply because Carrie’s vocal is always the louder than the production. As a product of Broadway, it’s not a surprise that Chenoweth has some incredible vocal talents. On her version she delivers the power ballad to the best of her ability, but seems to fall a little short because her voice isn’t quite strong enough for a song this big. Carrie Underwood is pretty much a vocal force to be reckoned with, especially when it comes to power ballads. Underwood delivers the song with some incredible vocal skills that force you to listen to her rather than the production. Simply listen to the chorus and the bridge and you’ll hear what I’m talking about. Being a Tony Award winner, you would think Chenoweth has the ability to drench a song with loads of emotion and heart. Unfortunately, that talent ability doesn’t show off on this tune. Kristin merely delivers the song without showing any emotional connection she might have had to the song. Carrie is no stranger to delivering songs with incredible emotion and attitude (please revisit “Jesus, Take the Wheel” if you need proof) so it’s no surprise that her delivery is just as incredible as her vocal performance. You can hear that there was a connection from Carrie to the song that comes over in the final cut. I personally became a fan of Kristin Chenoweth’s vocal talent after seeing her guest star on the hit show Glee, but she doesn’t pack enough hit to match Carrie Underwood on this country-pop ballad. Carrie simply out sings, out performs, and out does Kristin on this song. "Swingin’": Who Done It Better, Chris or Leann? For this edition of Who Done it Better, we are examining two different remakes of John Anderson’s 1983 classic, “Swingin’.” Chris Young recorded the song for his 2010 Voices EP while Leann Rimes recorded the song for her 2011 covers album, Lady and Gentlemen. How do these completely different versions compare to each other? “Swingin'” became a number one hit for John Anderson back in 1983 and instantly became a country music classic. Written by Anderson along with Lionel Delmore, the song gives a flirtatious account of how the narrator discovers his infatuation for a young Charlotte Johnson by simply swinging on her front porch swing. The song at first glance seems like country filler but John Anderson’s fantastic vocal delivery keeps it anything but filler. Chris’ version utilizes a much slower tempo from the original. Rather than enlisting the help of a full backing band, Young delivers an acoustic version of the song leaving behind all the bells and whistles the original consisted of. Leann’s version kicks the song’s tempo up a couple notches which gives it more life and personality. The horns are also replaced in this version with killer guitar lines delivered by Vince Gill. Chris is one of country’s latest troubadours. He usually leaves behind any vocal tricks in order to deliver a simple, consistent vocal. Here, he simply sticks to the original’s vocal styling by delivering the song in a consistent tone. The problem here is that the song needs personality from its singer. Leann delivers one of the best vocal performances of her career on this song. Not only does she do a great job in articulating each word to keep up with the song’s tempo, but she also gives the song new life by delivering a cheeky, sassy, and bubbly vocal performance to match the song’s flirtatious spirit. I’m a big fan of acoustic covers so the fact that this is such a simple version of the song makes me like it and appreciate it. Although I can’t say Chris did enough with it to make it original in any way. Leann does a fantastic job converting this song about “Charlotte Johnson” into one about “Charlie Johnson.” It takes a lot for a female to cover a classic delivered by a male artist, and Leann succeeds brilliantly. Both version are fantastic in their own right, but overall Leann’s version has the slight edge mainly because it’s more fun to listen to and brings the flirty ditty to life.